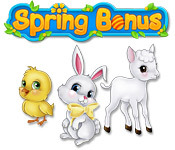 Spring Bonus is rated 4.1 out of 5 by 31. Rated 5 out of 5 by moonlit_rose from Cute Spring time Match 3 game I love to play seasonally appropriate games. A week before the first day of Spring I bought this game and I'm just about finished the day after Mother's day. I played a few levels a day, couple days per week. Never got bored, Always happy to hear the "pop" sound effect. What I love about this game: 1. The game is not difficult, but its not too easy either (if you play timed mode, which I always do). Nearly all levels I completed on the first try. I'm currently on level 94/100, which I have failed four times. If it were to become frustrating I can always take timed mode off. 2. The objects to match are bright primary colors that are a breeze to differentiate. 3. The sound effects are fun, power ups sound just as they should, twittering birds and ice melting sun rays that go with the graphics. What I don't like: Just one thing. In my opinion, you have to love Match 3s to finish this game. The level goals and flow of the game aren't varied at all. And, despite what the description says about helping the Easter bunny, there is not the tiniest drop of story. No town to construct, no decorations to put up means there's no "Oooooo, what will I get next?" Just lots and lots of matching. I don't know that I would ever replay this game but I am happy I bought it. Rated 5 out of 5 by RoseDorothy from Addicting Great match 3, no other games with it which was refreshing. I loved the graphics. Very pleasant and spring like. Rated 5 out of 5 by denniann2 from let's match those eggs. good for adults and kids!!! this is a great M3 for adults and kids. there is 100 levels and none of them are hard or require a lot of strategy. it was a fun game. i really enjoyed it!!!!! Rated 5 out of 5 by luvret from So much fun--never get tired of it. This game is simple but fun. I love the graphics and I never get tired of playing the game come Spring. I keep the screen saver from this game on my computer all the time. I just wish the creator of this game would come out with a Fall Bonus, Winter Bonus and a Summer bonus of the same type so I have a game for each season. I have owned this game for a couple of years and keep checking in to see of they have come up with more seasons but alas they have not : ( ---what a shame because I would gladly purchase more of this type.. 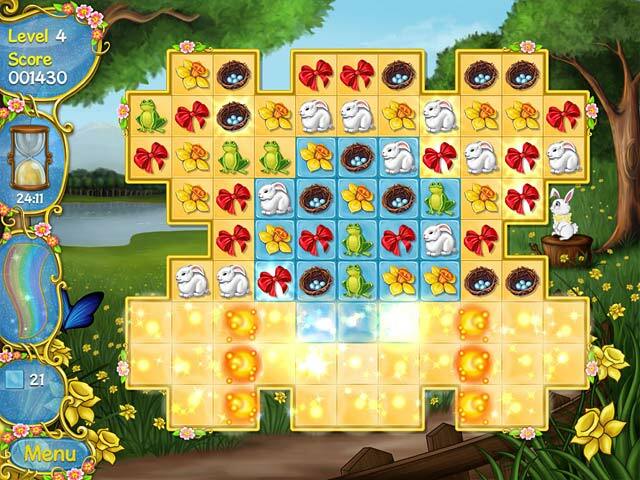 Rated 5 out of 5 by sparklefish777 from Charming & Cheerful This is a great springtime game. Graphics are sharp and clear and animation is simple and sweet! Match 3 items including eggs, cupcakes, flowers and ribbons. 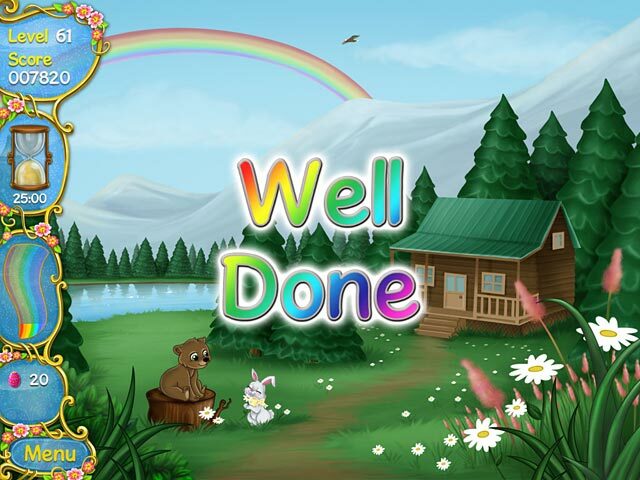 There are pretty backgrounds which include bunnies, farms, trees, grass, etc. This is an easy game, but it's relaxing instead of boring. Great game! Spring is in the air! 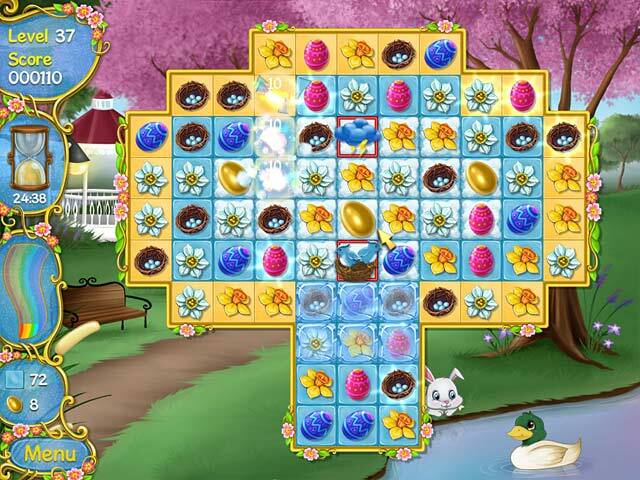 Journey through the beautiful Spring countryside with the Easter Bunny in this adorable Match 3 game!